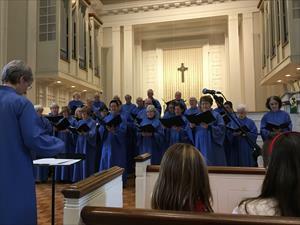 The Chancel Choir has a repertoire ranging from classical to spirituals and sings for the 11 a.m. worship service in the Sanctuary. 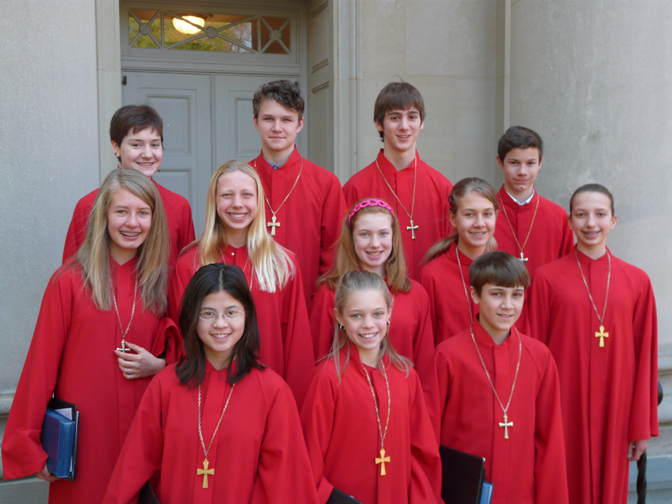 The choir has been on three tours to Europe, has partnered with various Davidson College choirs, and has hosted and sung with Christ Church Cathedral, Oxford, England. Adults and students are welcome. They rehearse Thursdays from 7:00 p.m. to 9:00 p.m. The Geneva Choir sings at the 8:30 a.m. service in the Lingle Chapel. College students and adults join together to sing in this choir that rehearses at 5 p.m. Sundays. Middle and High school students rehearse Sundays 6:30 - 7:30 p.m. 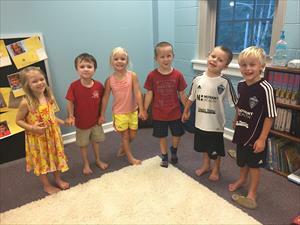 They sing regularly for services and may attend the Montreat Music Conference. Children's choirs- both voice and bells- meet on Wednesday nights. Click here for a detailed brochure on all children's choirs. 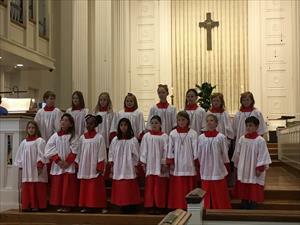 The Junior Choir is third through fifth graders who rehearse from 5 p.m. to 6 p.m. Wednesdays and sing in worship once a month. 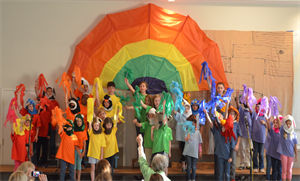 Once a year they perform a musical and may attend the Montreat Music Conference. 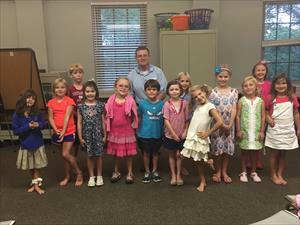 First and second graders in the Primary Choir occasionally sing for worship and join the Junior Choir for the annual musical. They rehearse from 5 p.m. to 5:45 p.m. Wednesdays and learn musical skills and the importance of being responsible choir members. The Beginner Choir is for 4- and 5-year-olds to teach enjoying the music making process, finding the singing voice, matching pitch, and keeping a steady beat. They sing once or twice a year in informal settings. The Tower Ringers is for advanced ringers. They rehearse on Wednesdays at 7 p.m. They play for the church periodically and give a Christmas concert in early December. Alleluia Ringers is an intermediate ringing choir. They rehearse on Sundays at 4:00 p.m. They play for the church periodically and give a Christmas concert in early December. The Children's Handbell Choir is for students in grades three through five. They rehearse on Wednesdays at 4:15. The Music Team leads music for the 9:45 service. 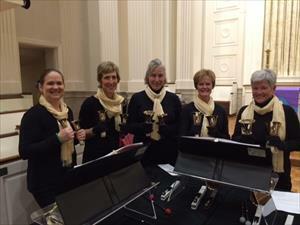 The group practices on Wednesday nights at 8:30. The music style spans a wide range including contemporary worship music, to hymns, global music, and folk/bluegrass. Singers and players of any instrument, of all ages and skill levels, are invited to participate. Contact David Brinson: DBrinson@dcpc.org if you’re interested in participating. From time to time, liturgical dancers are called upon to interpret music or scripture for worship or other special events. Anyone interested in interpreting scripture and music through use of movement and dance is encouraged to register with the church music office. Instrumentalists often supplement the hymns or provide accompaniment for anthems. The church band rehearses on an ad hoc basis. People who play an instrument please contact the music director. Scripture readings are often brought to life when dramatized or read in character. Good readers or those with a dramatic flair interested in interpreting scripture in a fresh setting, please contact one of the pastors or the music director. Commitment is for a single event.